Before its launch and availability in devices, Qualcomm’s Snapdragon 810 was being touted as being the company’s best achievement so far. Its future seemed to be set in the stars, with reports lready indicating that manufacturers lining up to use the SoC in their devices. But then things started to go wrong for the US chipmaking giant. Since this was all before the launch of Samsung’s Galaxy S6 duo, most were expecting the Korean manufacturer’s highly anticipated annual flagship launches to be paired with Qualcomm’s SoC. After all, Samsung had being doing so consistently in the past, and what could possibly make it change its mind this time around? The answer to this question started out as the Galaxy S6 suffering from overheating issues as Samsung was going towards an all metal build for the device. But while it was enough to keep things rolling for sometime, as we neared the device’s launch, the whispers began to grow. The Snapdragon 810 was overheating, and Samsung was looking at other options. All this led to the Galaxy S6 Duo being launched with the company’s Exynos 7420 processor, based on the 14nm FinFET process, and far superior to what Qualcomm had to offer on many fronts, save its GPU. Fast forward to the HTC One M9, and we saw the Taiwanese company face a near fail flagship launch mostly due to the Snapdragon 810. 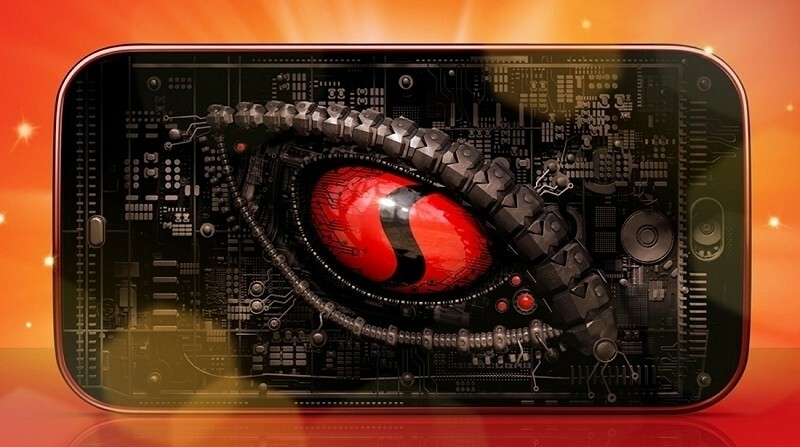 All of this set its future in stone, and even though other manufacturers have still chosen to stick with Qualcomm, the Snapdragon 810 will undoubtedly go down in history as the SoC that could have been. Folks over at MobileDroid have decided to put it all to the test and have compared the performance of several processors w.r.t overheating. The Snapdragon 810, 808, 805, Apple’s A8, Intel’s Atom and Samsung’s Exynos 7420 and 5433 have all been put to the test and their individual scores compared to averages in order to gain a better understanding of which processor comes out on top in hot conditions. The results will surprise you as to which SoC does come out on the top, even as the Snapdragon 810’s weakness is once again put in the spotlight. 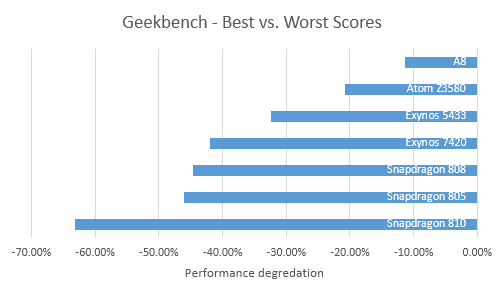 Starting from a comparison of an average of every SoC’s best scores vs worst scores, we clearly see what goes wrong in the Snapdragon 810. Qualcomm’s current processor flagship sees a massive 60% decrease in its performance from its best scores, which goes to show that all those HTC One M9 complaints weren’t without merit after all. 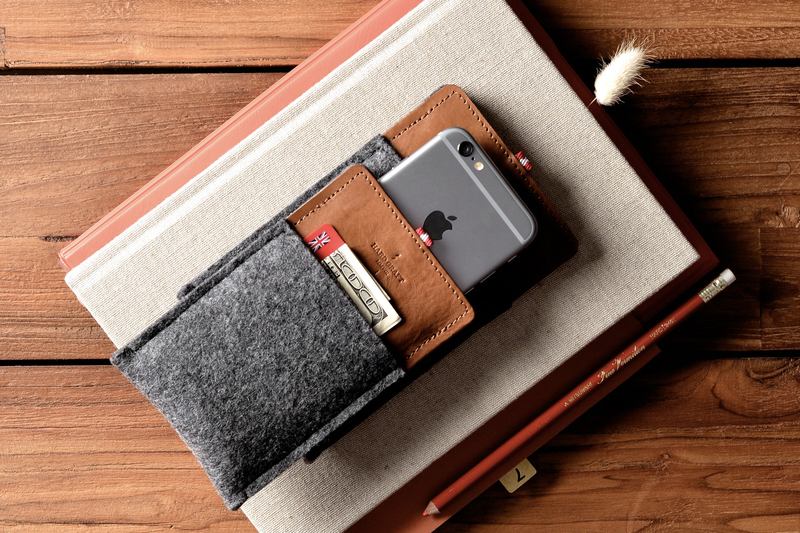 The top two places are bagged, surprisingly by Apple’s A8 for the iPhone 6 and Intel’s Z3580. 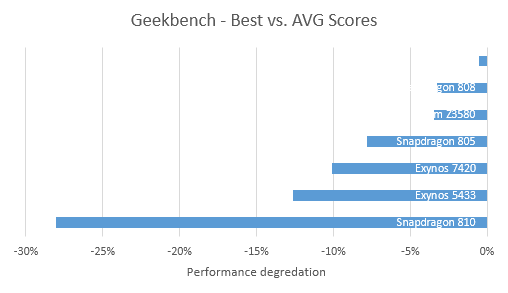 Apple’s processor manages to achieve only a performance degradation slightly greater than 10%, while Intel’s processor isnt that far ahead either. Samsung’s much hyped Exynos 7420 only manages to do slightly better than Qualcomm’s Snapdragon 808, rumored to replace the former on Samsung’s Galaxy S6 Edge Plus. 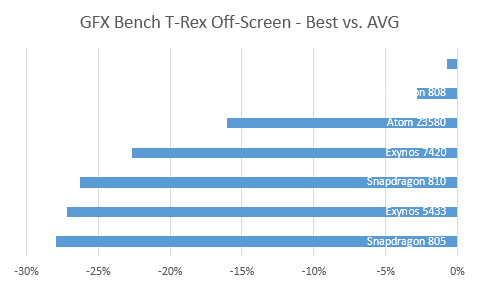 Moving towards a comparison of best scores compared to average scores, we see that the Snapdragon 810 suffers less of a performance differential this time around. That doesn’t stop it from coming in last place, once again, and seeing its performance reduce to nearly double of what Samsung’s older, Exynos 5433 has to offer. In top place is once again Apple’s A8 which suffers from an almost zero reduction in performance. In second place this time is Qualcomm’s Snapdragon 808, which takes away second place, despite having two cores less than its older brother, the Snapdragon 810 and Samsung’s 14nm Exynos 7420 Octa. After all, Qualcomm’s been playing in this pond for quite a while now, and we shouldn’t expect anything less from the US chipmaking giant. In Graphics benchmarks, we have a surprising contender for second place. Qualcomm’s Snapdragon 808, with its Adreno 418 manages to top every processor and GPU out there, save, once again, Apple’s A8 and its Powerscore GPU. In third place is Intel’s Atom Z35800, which is followed by Samsung’s Exynos 7420 and the Snapdragon 810, which finally sees its position improve from last place, undoubtedly the courtesy of its powerful Adreno 430. The greatest performance drop as a result of heating is on the Snapdragon 805, which should not come as a surprise to anyone. So here we have it folks. Today’s scores really do end up showing where the Snapdragon 810 suffers. The processor clearly lacks the ability for sustained performance under high temperatures, and we hope folks over at Qualcomm have figured out why. All eyes on the company’s next Snapdragon 820 processor, which will be coming with its own custom Kyro cores by all accounts. The surprise winner today is Apple’s A8, which goes to show the Cupertino manufacturer’s prowess in hardware which is rarely given its due credit. Intel’s Atom processor doesn’t do that bad either, but one of the major processors of the day is the Snapdragon 808, which appears to be Qualcomm’s backup flagship until the Snapdragon 820 comes out. Agree? Disagree? Let us know what you think in the comments section below and stay tuned for the latest.